What do Michael Milken and Martha Stewart have in common? (Answer: Both became public scapegoats for an outrageous era of greed and excess.) What was the most outrageous party thrown by a financial baron of the twentieth century? (Answer: Tough call, but either Michael Milken's Predators Ball in 1985, or Dennis Kozlowski's Sardinian birthday bash in 2001, with its vodka-spouting sculpture.) Which U.S. war hero president became party to, and victim of, an unabashed con man known as the Napoleon of Wall Street? (Answer: Ulysses S. Grant, but it's a long story. )These questions and more are discussed in Scott MacDonald and Jane Hughes' Separating Fools from Their Money. The authors trace the history of financial scandals from the early days of the young republic through the Enron/WorldCom debacle of modern times. A host of colorful characters inhabit the pages of this history, revealing human nature in all of its dubious shades of gray. 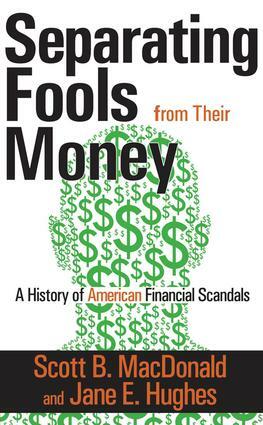 At the same time, the book exposes themes common to all financial scandals, which remain astonishingly unchanged over more than two centuries--greed, hubris, media connections, self-interested politicians, and booms-gone-bust, to name a few.Informative and entertaining, Separating Fools should engage the interest of investors and casual business readers, as well as economists interested in supplemental reading for their students.A new introduction focuses on trends since publication of the original, with a postscript on the financial panic of 2008. The 1990s B.E. (Before Enron): A Few Bad Apples, or Rotten to the Core?